This Happy Sport 36 mm automatic watch sparkles with femininity. 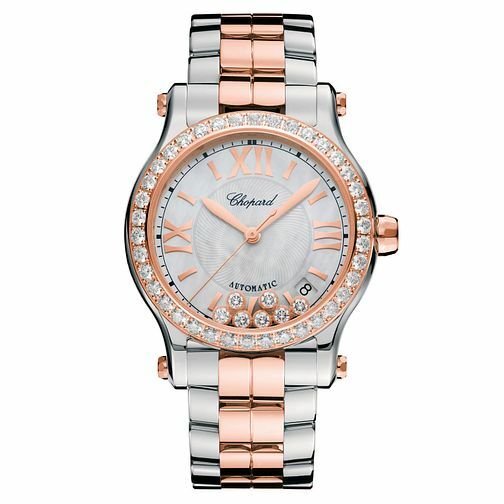 Stunningly crafted from 18-carat rose gold and stainless steel with a diamond-set bezel and matching two-tone metal bracelet, its stylish aesthetic is perfectly Chopard. The mother-of-peal dial provides a precious backdrop for the rose gold-tone Roman numerals and hands, while seven of Chopard's signature moving diamonds playfully dance in an exuberant display of light.